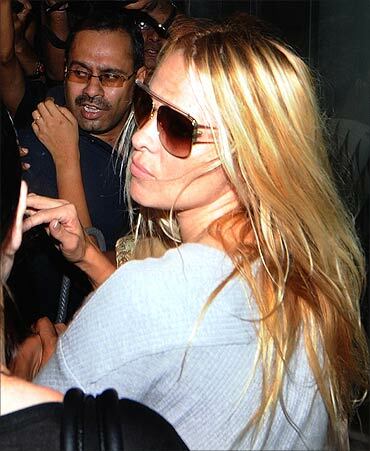 Pamela Anderson's arrival in Mumbai on night resulted in chaos at the Chhatrapati Shivaji International Airport. The 43-year-old is all set to captivate the audiences as she enters the television reality show Bigg Boss this week. Pamela was dressed in a long grey outfit. A pair of sunglasses shielded her from the media glare. Heavy security surrounding the Baywatch star frustrated the mediapersons' attempt to get close. The place was so packed that the actress was forced to use a different exit. Not surprisingly, a scuffle broke out between a photographer and a cop in the melee. Pamela is expected to stay in the house for three days, for which she is reportedly being paid a whopping Rs 2.5 crore. "It is my first visit to India so I hope I will be able to get some impressions of the country during my stay," Pamela said. I am very excited to be in India and to meet the Bigg Boss house mates," she said. Earlier, the late reality TV star Jade Goody appeared in Bigg Boss in 2008. This time Bigg Boss season 4 has already seen eclectic mix of housemates including WWE superstar Khali as a wild card entry, Veena Mallik and Begum Nawazish Ali from Pakistan. Now, with Pamela on board, the show just got more interesting. What do you think? 22 years on, Pam Anderson still makes the cover!